You’re Invited to our Holiday Customer Appreciation Party!! RE/MAX Heritage would like to personally thank all of our wonderful clients for making 2017 a spectacular year! 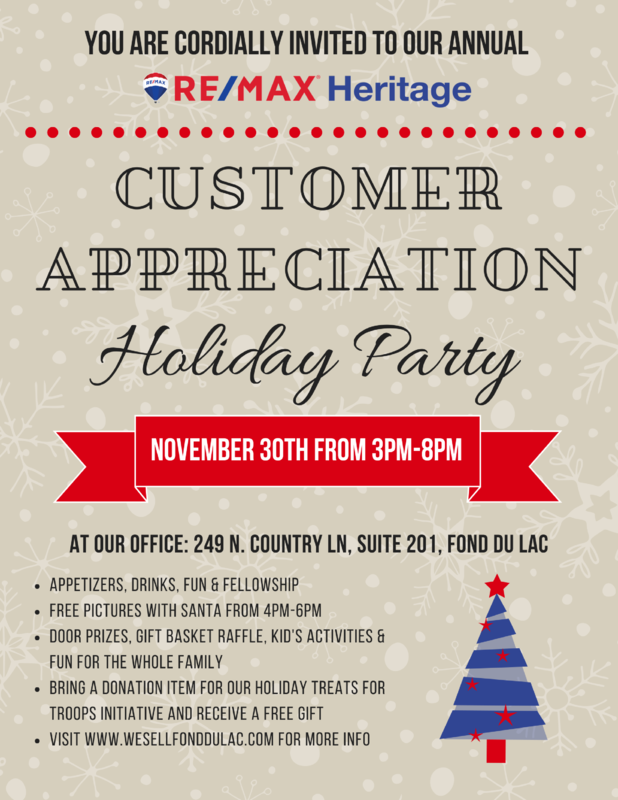 Please join us for our 3rd Annual Holiday Customer Appreciation Party on Thursday, November 30th from 3pm-8pm! Friends and family are also welcome! Appetizers, drinks, fun & fellowship! Bring a donation item for our Holiday Treats for Troops initiative and receive a free gift! If you have questions regarding the Holiday Treats for Troops Care Package Drive or any questions regarding the party, please call our office or email Ashley@WeSellFondDuLac.com – We hope to see you there! !